Suspended National Prosecuting Authority (NPA) Senior Executive Advocates Nomgcobo Jiba and Lawrence Mrwebi have successfully challenged the High Court judgment which declared them unfit to practice as advocates. The Supreme Court of Appeal (SCA) in Bloemfontein has ruled that the High Court in Pretoria misdirected itself when it ordered that Jiba and Mrwebi be removed from the roll of advocates. The Appeal Court found that the General Council of the Bar failed to prove a case of misconduct against Advocate Jiba. The case against the duo related to the controversial withdrawal of among other things, murder and corruption charges, against former Police Crime Intelligence head, Richard Mdluli. However, the court was more scathing on Mrwebi’s conduct. The court ordered that Mrwebi be suspended from acting as an advocate for six months. The suspension period has since lapsed as it was effective from the 15 September 2016. “Mrwebi provided contradictory explanation if, when and why he decided to withdraw the charges against Mdluli. The majority judgment found that in respect of Mrwebi the GCB established the alleged offending conduct. 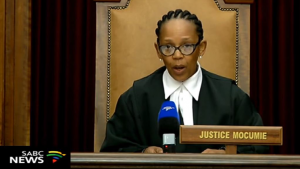 However, due to the fact that there was no personal gain from Mrwebi’s misconduct and the fact that the purpose of such proceedings are to uphold the rules regulating the profession and not to punish the wrongdoer the sanction handed down by the High Court was not justified,” says SCA Judge Connie Mocumie. The General Council of the Bar was not immediately available for comment. Jiba’s Attorney Zola Majavu welcomed the SCA verdict and said Jiba was looking forward to resuming her duties at the NPA. The post Jiba looking forward to resuming her duties at NPA appeared first on SABC News – Breaking news, special reports, world, business, sport coverage of all South African current events. Africa's news leader..